Yes, I know it’s technically The Hunger Games: Catching Fire. Shoot me. As with yesterday’s Breakfast Club, Catching Fire gets a very respectable 7.9 stars on IMDb. Nominated for a Golden Globe (albeit only for Best Original Song). At nearly two and half hours, it’s overlong (according to my perfect movie theory), but to be fair, the story trundles along nicely. After the events of The Hunger Games, we catch up with Katniss and Peeta as they undertake the Victor’s Tour of the districts. Their… somewhat unusual win in the 74th Hunger Games has led to unrest and President Snow is keen to quash the imminent rebellion. Cue the 75th Hunger Games and a twist on proceedings known as the Quarter Quell, in which Snow decides to hold a Hunger Games where previous winners will compete again… Ooh, you dastardly dastard, you. I must confess that I’d not read the second book in the trilogy before seeing this movie. I read the first book some years ago and utterly lost myself in the story, devouring it almost in a single sitting. Not sure why I didn’t read the others (something shiny came up, no doubt), but I was keen to see what happened in the movie. It’s more of the same, really. It takes an inordinately long time for President Snow (Donald Sutherland on splendid form) to decide that dear old Katniss needs to be brought to heel, so engages the talents of Plutarch Heavensbee (the late and much missed Philip Seymour Hoffman – more of him in later posts, no doubt) to concoct a devious scheme to see her off. The leads crack on with the job in hand. J-Law is on fine form and is always eminently watchable, as are Josh Hutcherson as Peeta and Woody Harrelson as Haymitch. Stanley Tucci positively glows as Caesar Flickerman – please please can we have a spin-off TV series of what he does between the annual Hunger Games? I would *love* to see that. Perhaps he and Effie (Elizabeth Banks almost as unrecognisable under almost as much makeup as Tucci) could co-host something? The story itself is fine, but for me the first is better. That said, there are weird things in both which have always bothered me about the actual Hunger Games themselves – why do the kids gang up together? There’s only ever going to be one winner, so surely it’s everyone for themselves. It kind of makes more sense in this one once we work out what the big plan is, I suppose. But in the first film there are bits where you’re just left wondering why on earth you’d go to sleep next to four or five other people who ultimately want to see you dead. Towards the end I found myself paying more attention to Katniss’s quiver of arrows than the action. It seemed to magically refill itself on several occasions. Look! Attacked by monkeys! Arrows gone. Back on the beach five minutes later? All back. Fire some more, down to three. Five minutes later? All back. And the lightning striking the tree – big boom as the lightning strikes. But the tree is *way* over there. Sound travels slower so it should be lightning *then* the noise, surely? I’m being overly picky, I know. The ending caught me entirely off-guard, having not read the books, and it’s always fun when that happens. I’m looking forward to Mockingjay, though heaved a sigh when I found out they’re splitting it into two movies. Perhaps I should go read the books. Absolute, unashamed gloriously good fun. Classic girl-meets-boy-who-turns-out-to-be-a-Fae-prince. Cross Buffy with Harry Dresden, add a touch of Lovecraftian elder gods and simmer gently for 400 pages. Serve hot. 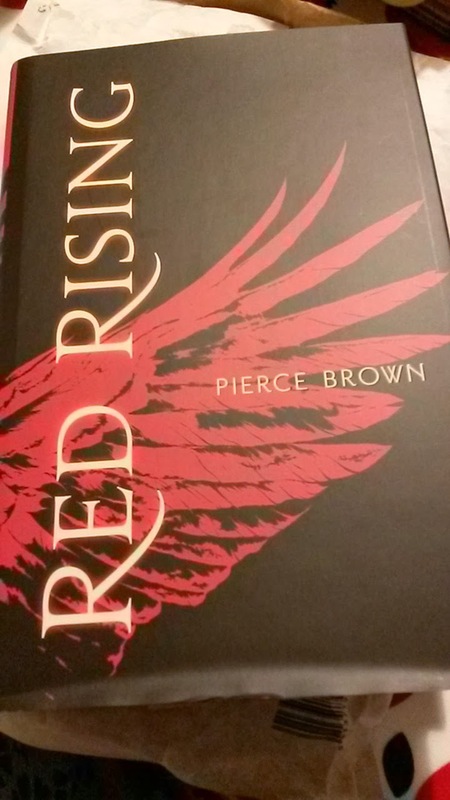 I first heard of Red Rising through Twitter. Various people I follow were waxing lyrical about this new book. Then Liz from Liz Loves Books put it at the top of her books of 2013 and I knew that I had to add it to my list. I was lucky enough to receive an advance copy from Hodder & Stoughton and dived right in. Nearly everyone will compare this book with The Hunger Games and there are echoes of that here, along with shades of Ender’s Game, but laced with the outright brutality and deviousness of Game of Thrones. It’s hard to talk too much about the story without giving away too many twists and turns, but suffice it to say that it’s brilliant. It’s a veritable rollercoaster of a book – the first third is one of the best openings for a book I’ve read for a long, long time. Then it kicks up a notch and you’re swept along. Is it a YA novel? Much like in the Hunger Games, the main characters are quite definitely young adult, but this is quite definitely much darker and far nastier than that. The huge cast of characters are beautifully realised and well-rounded, and the world-building is absolutely top-notch. It’s one of those books that you just lose yourself in, and emerge blinking into the daylight at the far end. I devoured it over the course of a couple of days, staying up entirely too late (and getting up entirely too early) to read just one more chapter. Fair warning though, it’s the first in a trilogy and whilst Red Rising wraps up nicely, you’re definitely left wanting more. More now. I want book 2, now. Made me laugh. Seriously, the cigarette smoking is the bit you’re worried about? Regular readers will be aware that I have a certain… fondness for coffee. Absolutely love the stuff. What’s not quite so obvious from this blog is that I’m also a huge fan of tea. Really enjoyed this – interesting idea too, a struggling crime writer getting caught up in his work a little too much. I liked the way you got snippets of the fictional author’s book throughout the main story, and got to experience some of the frustrations of being a writer, seeing how it all pans out. Great fun.